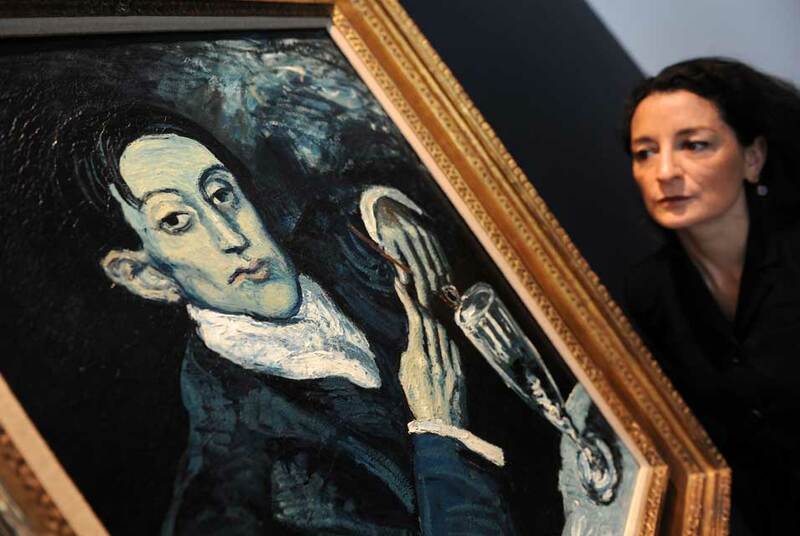 Giovanna Bertazzoni, Head of Impressionist and Modern Art at Christie's, London looks over Picasso's 'Portrait of Angel Fernandez de Soto (The Absinthe Drinker), 1903, at Christie's auction house in London, Britain. The painting is expected to fetch in the region of 33-45 million euros at auction in June. EPA/ANDY RAIN. LONDON.- Christies announced that they will offer an exceptionally important and highly celebrated masterpiece by Pablo Picasso (1881-1973) in the evening auction of Impressionist and Modern Art in London on 23 June 2010. Painted by the most influential artist of the 20th century, Portrait of Angel Fernandez de Soto, 1903 comes from the artists celebrated Blue Period, arguably the greatest period in Picassos career. The painting will be priced at £30 million to £40 million and all the proceeds will benefit The Andrew Lloyd Webber Foundation, a charity founded by the celebrated composer in 1992. Working for the public benefit, The Foundation focuses on the promotion of arts, culture and heritage in Britain. The painting had been consigned for sale at Christies in New York in November 2006 but was withdrawn from the auction at the request of the vendor after an 11th hour ownership challenge based on a sale of the painting in the 1930s. This challenge has since been resolved by agreement and the claimants have withdrawn all claims to the painting, leaving the Foundation free to sell the work. The painting was acquired by The Andrew Lloyd Webber Foundation at auction in New York in May 1995 for $29.2 million from the Stralem Collection using funds donated for this purpose by Lord Lloyd Webber. Since then the market for works by Picasso has grown considerably and over 10 works have sold in excess of this figure, including 3 works which have realised over $50 million. In 2004 the Rose Period Garçon à la pipepainted only two years after Portrait of Angel Fernandez de Sotobecame the first painting to sell at auction for over $100 million. Jussi Pylkkänen, President of Christies Europe, Russia and the Middle East: We are honoured to offer Picassos portrait of Angel Fernandez de Soto at auction in June on behalf of The Andrew Lloyd Webber Foundation. This is one of the most important works of art to be offered at auction in decades, and the opportunity to acquire such a masterpiece of 20th century art is sure to prompt great excitement amongst collectors and institutions around the world. It is worth celebrating the fact that all proceeds from this historic sale will benefit arts, culture and heritage in Britain. Picasso said his paintings were his autobiography, and nothing expresses that more than Portrait of Angel Fernandez de Soto: this picture perfectly demonstrates the artists skills at the peak of his Blue Period, while also providing an intimate insight into his own life and circle of friends. Sitting with his glass of absinthe and his pipe, the smoke curling upwards, Portrait of Angel Fernandez de Soto is the very embodiment of Blue Period aesthetic, rendered in bold, loose, swirling brushstrokes that recall El Greco and trumpet Picassos virtuosity. Picasso had met Angel in 1899 at the famous café Els 4 Gats, a celebrated artists gathering place which they would both frequent during the latter part of the 19th Century and the early years of the 20th Century. He had immediately been drawn to his natural stylishness, and the pair became inseparable dandies: owning only one pair of gloves between them, they would wear one each and keep their other hand hidden. Angel and his brother Mateu were both artists. While Mateu was a gifted sculptor, Picasso referred to Angel, a painter, as an amusing wastrel. He was more dedicated to drinking and partying than to art, enthusiasms that Picasso was often willing to indulge. Angel would eventually become a deputy of the arts before being killed in the Spanish Civil War, but during the wayward period of their youths was immortalized in several of Picassos pictures which record their antics in the bars and brothels of Barcelona and are now in the Museu Picasso, Barcelona. This penchant for partying, which would distract Picasso so much that he moved to another studio, is discreetly evident in this contemplative portrait. Angel is shown with a glass of absinthe, the Fée verte espoused by so many of the celebrated creative minds of the Belle Epoque including Picassos own hero Henri de Toulouse-Lautrec, as well as artists and writers such as Paul Gauguin, Vincent van Gogh, Charles Baudelaire, Arthur Rimbaud and Paul Verlaine. This controversial beverage, celebrated for its almost hallucinogenic effects and feared because of its addictive properties, was the subject of Edgar Degas Labsinthe, the first Impressionist picture sold at Christies, bought in 1895 for £189 and now in the Musée dOrsay, Paris. The drink was seen by many as a fount of creativity, and featured again and again in Picassos own work, from his Absinthe Drinker of 1901 now in the State Hermitage Museum, St. Petersburg to his 1914 sculpture, Le verre dabsinthe, now in the Centre Georges Pompidou, Paris. Angel and Picasso twice shared studios in Barcelona, the second time being during the 1903 trip when Portrait of Angel Fernandez de Soto was painted. This was the same studio in Riera de Sant Joan that Picasso formerly shared with his friend and fellow artist Carles Casagemas, whose suicide had partly inspired the Blue Period. Immersed again in these surroundings and these friends, Picassos Blue aesthetic flourished, culminating in portraits such as Portrait of Angel Fernandez de Soto which introduced a revolutionary, subjective psychological quality. Many of the oil portraits of Picassos friends painted during this stay in Barcelona are now in museum collections: his Portrait of Sebastià Junyent is in the Museu Picasso, Barcelona; Sebastià Junyer Vidal and a Woman in a Café is now in the Los Angeles County Museum of Art; Portrait of Señora Soler is in the Bayerische Staatsgemäldesammlungen, Munich; Portrait of Benet Soler is in the State Hermitage Museum, St. Petersburg; and The Soler Family is in the Musée des Beaux Arts, Liège.